My name is Sophie Stableford, and I graduated from Huddersfield University in 2006. I am a member of the Society of Chiropodists and Podiatrists and the Health Professions Council. Since qualifying I have worked as a specialist Podiatrist within the NHS. This has provided me with extensive skills in assessing, diagnosing and treating various foot related conditions, particularly high risk and complex cases. I regularly interact with the wider multidisciplinary team to provide holistic care plans, and also hold specialist clinics in wound care, biomechanics and nail surgery. Working as an autonomous practitioner, I have experience in community clinics, hospital and domiciliary settings covering a wide geographical area. Maintaining a continuing professional development portfolio and attending pertinent courses is essential in supporting a quality foot care service. I also enjoy facilitating student placements which is a great supplementary aspect of my podiatry role. 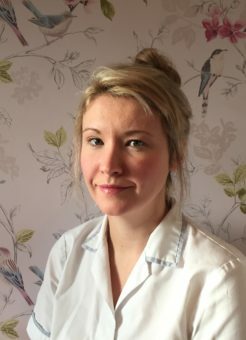 I am delighted to have been given the opportunity to treat patients in a private setting at Southport Osteopathy as this has long been an aspiration of mine. I feel passionate about being able to provide a high level of service to clients and to promote holistic treatment planning with continuity of care. Problems with our feet can occur at any stage of our lives and a podiatrist specialises in being able to assess, diagnose and treat a whole host of lower limb and foot pathologies. Prevention of foot problems, education and advice is also a very key role in maintaining foot health. Many medical conditions can also affect the feet such as diabetes, rheumatoid arthritis and vascular issues to name a few. People with such conditions are often referred to a podiatrist through the healthcare system to establish how we can help. The term podiatrist is now a universal description reflecting advances within the profession, such as performing nail surgery, debriding foot/ leg wounds and biomechanics. Podiatry is basically the newer term for chiropodist, but is still used interchangeably to describe a footcare specialist. Even if you feel that your feet are in good condition, it is always beneficial to have an assessment for foot health advice. Patients of all ages are welcome, and we aim to promote a relaxed and friendly environment in which to discuss and treat your foot concerns. Please click on the podiatry page for details of treatments and costs.